How are you? I hope you’ve had a good and restful weekend. On Saturday, we enjoyed a relaxing garden party in the grounds of Campion Hall, and celebrated our wonderful Fr Matthew’s birthday! 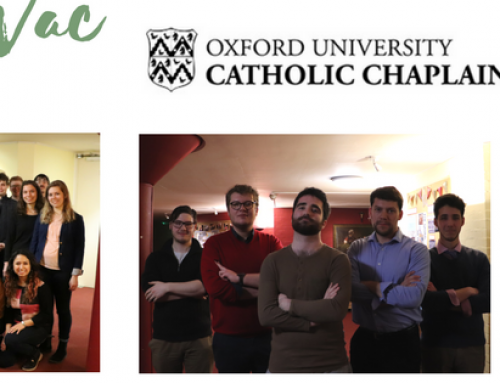 Thank you to all who worked hard to organise and host such a glorious event, especially the committees of the Newman CathSoc and Companions of the Order of Malta, and the Jesuits at Campion for welcoming us so warmly into their home. Thank you also to Providence, for holding off the downpour until the very end! Life here is always busy and varied, and we have much to look forward to over the coming weeks. On Pentecost Sunday, we will have great joy in celebrating the Sacraments of Baptism, Confirmation, and Holy Communion with 6 members of our community. Bishop William Kenney will join us for the 5:45pm Mass, which this week will be a Sung Mass held in the Newman Room. It would be wonderful to see all of you there for what will be a time of festivity for all of us. Mass will be followed by a meal and wine reception, to which all are welcome. Whether or not you can make it, do be sure to keep those preparing to recieve these Sacraments in your prayers over the coming days. If you haven’t yet made it to Nightfever this year, this Friday is for you! Our termly evening of praise, Adoration, and evangelisation will be held this coming Friday from 7:30pm in Blackfriars. We will go out into the street in pairs, inviting passers-by to come in and light a candle before the Blessed Sacrament. It is always a beautiful evening, filled with grace and mercy. If you are interested in volunteering, please get in touch with either myself or Simone (simone.delzin@sant.ox.ac.uk). We very much hope to see you there. We are praying especially now for finalists, as you make your final push towards exams. Please don’t hesitate to stop by for a chat if you’re feeling overwhelmed, or just need a break. We Chaplains are here for you, and are always ready to talk! We would like to invite you to a celebratory Finalists’ Brunch this Saturday from 10am. Even if you can only spare a short while, we would love to see you! Keep an eye out for a Facebook event in the next day or so, and please RSVP by either emailing me or replying ‘going’ on the event so that I can get an idea of numbers. 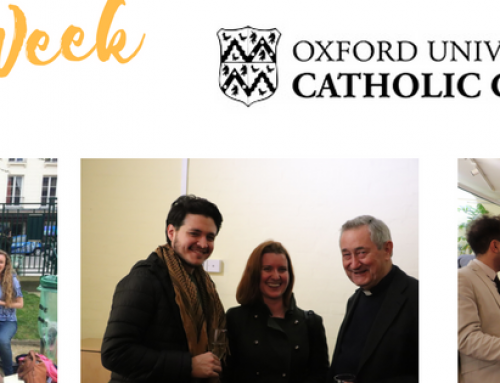 Very finally, the Newman CathSoc Thomas More Lecture will be held next Monday with the title ‘Thomas More and Dame Alice: a new reflection on a relationship as defined by artefacts’. More details in the schedule below. Make sure to save the date! All this and more in our schedule below… See you very soon! Tuesday, Thursday – 8am Mass followed by FREE breakfast. Friday – 7:30pm; Nightfever held at Blackfriars. 6pm – Spirituality Series with Fr Ian, The Call of Christ: an exploration of the spirituality of St Ignatius of Loyola. Talk open to all in the Blue Room. 8pm – God in the Quad – Theta Prayer Group. The God in the Quad group meets to pray about their work and lives. FREE pizza and cakes provided. All postgraduates are welcome! This week’s talk is not to be missed! Justin Youngchan Choi will speak to the group on ‘Christianity in Korea’. All are welcome! As always, we will begin with a meal at 7pm, followed by talk at 8pm, and Adoration and Benediction at 9:30pm. 4pm – Cake and Crafts in the Strange Room. 10am – Finalists’ Brunch. 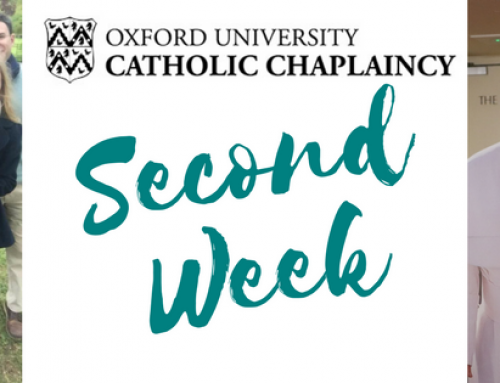 Join the Chaplains to celebrate the end of your time at Oxford, and be treated to a delicious and hearty brunch before exams begin! 9pm – PostGrad social in the Blue Room. Wine and nibbles provided, just ring the doorbell at ‘The Old Palace’ and we’ll let you in. Please contact Anna – anna.branford@some.ox.ac.uk or join the Facebook group for more information. Monday 21st May – 6pm; Thomas More Mass and Lecture. Join the Newman CathSoc at 6pm for Mass with veneration of a relic of St Thomas More, followed by a meal and a lecture by Jan Graffius (Curator at Stonyhurst College) on Thomas More and Dame Alice: a new reflection on a relationship as defined by artefacts. Friday 25th May – 7pm; Holy Unexpected. GK Chesterton and Julian of Norwich are our unlikely guides in this story of the history of Christianity in these lands, told through the surprising lives of eight holy men and women. This exhibition was presented at the London Encounter 2017 and includes a 40 minute feature film as its centrepiece. Some of the creators will be present to answer your questions! Saturday 26th May – 3pm; Join us in University Parks for a Chaplaincy Sports Day and picnic! Frisbee, rounders, and egg and spoon races in the sun… prizes and joy will abound. More info to follow shortly! The Long Vac is fast approaching (! ), and it might be time to start thinking about plans… There are many opportunities for retreats and pilgrimages with various Catholic groups, and too many to include on here! We will place a folder in the Narthex soon, by the ‘Retreats and Pilgrimages’ board, which has details of a range of trips on offer. If you fancy learning more, please drop me a message. For now, here are a couple of Chaplains’ recommendations… we’ll give you some new ones each week! 14th-22nd July – Magis 2018. An Ignatian pilgrimage through central Europe. Visit http://www.magis2018.org/, or contact Fr Matthew for more information. 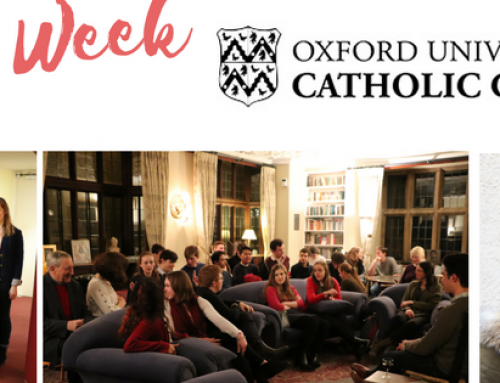 21st-28th July – ‘Thinking Faith’ – a study week for young Catholics. Boarbank Hall, Cumbria. Speakers to include Fr Luiz Ruscillo (Diocese of Lancaster) and Fr Richard Finn OP. Email Sr Margaret Atkins (margaret@boarbankhall.org.uk) for more info. That’s all for now. We are praying for you, and hope to see you all very soon! Fr Matthew, Becky, Fr Nick, Fr Ian.